Caption slip reads: "Photographer: Gaze. Date: 1955-07-13. Reporter: Gaze. Assignment: Goats beautify city. #1-2-9-10-13-14: Aid of two goats to spread the cleanup cleanup message was enlisted in Culver City yesterday by the Culver City Beautiful Committee. 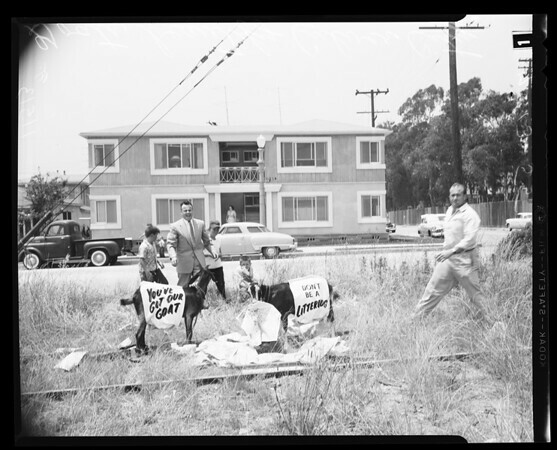 Members were careful to point out that it wasn't so much the amount of trash the goats consumed as it was the attention given to the stunt by residents in various sections of the community."